Arena shows are a tough thing, especially in the modern world. Back in the day, the Ninja Turtles would show up, tell a few jokes, kick a foot ninja in the face, and everybody goes home happy. But now these supposedly "kids properties" are the subjects of major motion pictures, with billions of dollars spent and effects by the wizards at Industrial Light and Magic. 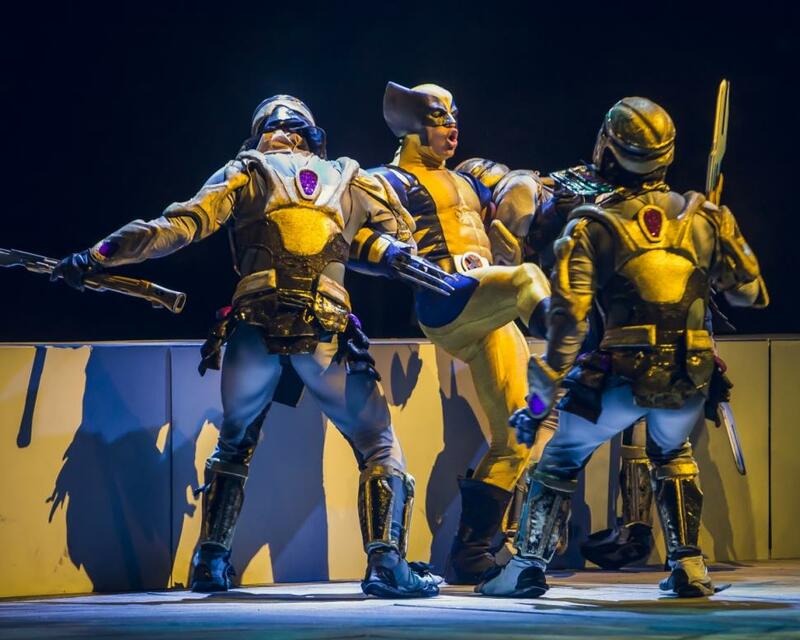 It's no longer enough to just show up in costume and call it a day - a modern arena show has to bring kids at least a semblance of the same magic they'll see on the big screen. So far, Batman was on point but disappointing, and How to Train Your Dragon (I can't believe we never reviewed this) blew me the hell away. So where does Marvel Universe Live fall on that scale? Somewhere in the middle. 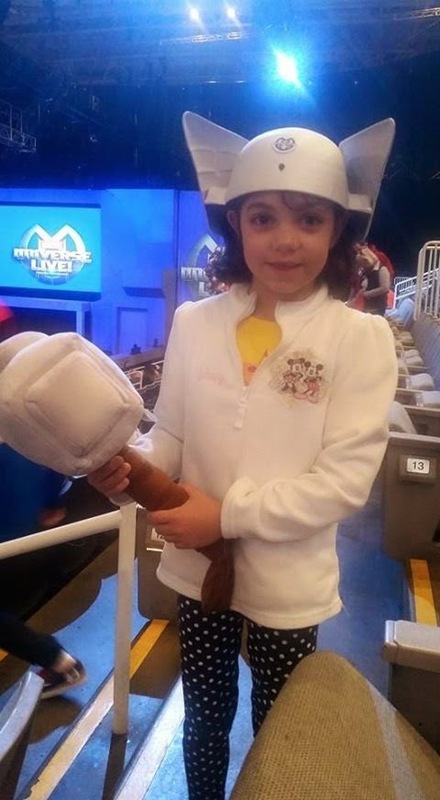 Yeah, that's a giant plush Mjolnir, and it comes with a totally sweet Thor hat. You bet I bought one of those. The souvenir program also comes with an official Marvel comic you can't get anywhere else, explaining the background of the show, and they sold a graphic novel that was a collection of the first appearances of Thor, Wolverine, Spider-man, Captain Marvel (Carol Danvers), Captain America and many more, which is a really sweet way to introduce kids to the comic books. The show's story is one of the surprisingly good parts about it. 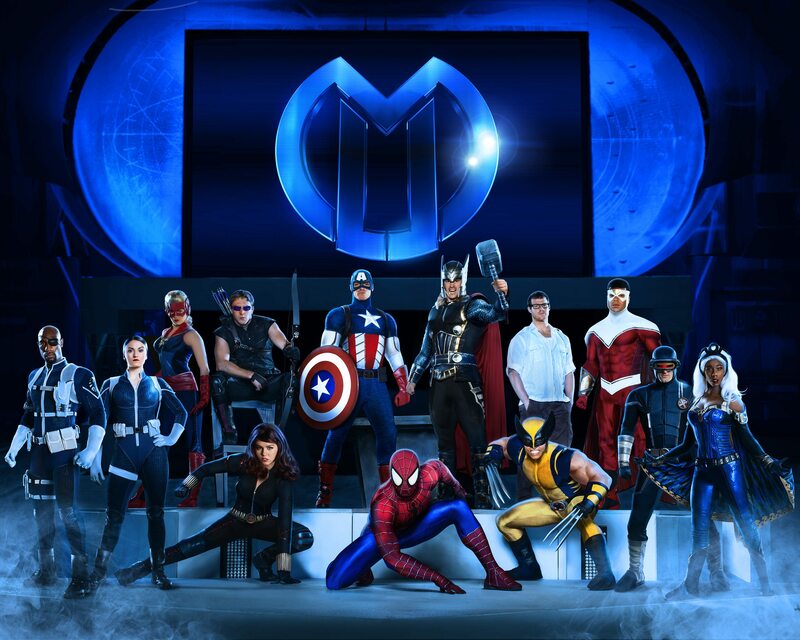 While it's a fairly straightforward "The Superheroes must team up to save the world" tale, they do a good job of giving everyone motivation and even a little character development. (Skip the next two paragraphs if you don't want to be spoiled on it.) The story goes like this: Loki steals the Cosmic Cube, and after beating him, Thor gets sick of the little blue thing screwing up everyone's day and destroys it, scattering three pieces across the world. The Avengers go home, and Tony gets bored - until Nick Fury and Maria Hill run into Loki, who has used the Cube's dust to build his own Cosmic Cube. Realizing they will need the Cube's power to stop Loki, the heroes assemble to collect the three pieces, which of course have fallen into the hands of AIM, Hydra and the Sinister Six. Cyclops and Storm have been kidnapped, and Loki is using their mutant energy to power his Cube, so Wolverine storms off to rescue them alone, followed by Bruce Banner. As Banner and Logan bond on a motorcycle trip through the Himalayas to Loki's base, the other heroes take off to retrieve the remaining pieces. What follows is a fun action adventure romp, that would be a great three or four heroes-teaming-up-and-punching-things arc in the comics. And I applaud Marvel for including several lesser-known heroes like The Falcon and Captain Marvel in their lineups. While it was clear that the crowd didn't really know who Carol Danvers was, it's important to get her name out there with her movie coming up and her comic doing so well. This was clearly a Marvel production through and through, designed to bring in new readers and fans. The show's fight scenes mostly consist of different stunt shows - Madam Hydra throws a whip around, Captain America gets into a really cool motorcycle chase with Red Skull, and Spidey hangs off the Goblin's glider to take a ride around the arena. There's even one Wolverine fight that's a straight claws-versus-Chitauri throw down, and it's everything you would want it to be. It's all well done, and the kids in the audience obviously had a great time. Unlike Batman and How to Train Your Dragon, this show has voice over actors portraying the characters while the actors hang out in their stunt suits. This is a great choice, and with a cast led by Nolan North as Iron Man and (I'm pretty sure) Steve Blum as Wolverine, you get some really good performances to go with your stunts. That on its own helps sell the show. The problems then come for the adults in the audience who aren't able to turn themselves into eight year old kids again. The show is very well done - but when you've seen something like How to Train Your Dragon Live, which uses the limitations of the stage rather than fights them, it's harder to fight past seeing the show for what it is. Captain Marvel spends most of her time flying around the stage, but as my wife put it, it looks like she has the Hover power from City of Heroes as she slooooowly crawls across the sky. When the Hulk finally puts in an appearance, the suit is awkwardly immobile and just looks fake. Some effects that could be really impressive, like whenever Cap throws his shield, have easily seen seems that break the immersion of the show. The choice to put the entirety of Thor's fight with Rhino and the Lizard behind a screen makes it really hard to see what's happening, which should never be a problem in an arena show. When you can spend thirty dollars than these tickets to get into Disneyland for a day, it's tougher to justify unless you've got kids. The long and short of it is, if you've got kids who love their Marvel, it's a fun couple of hours and they'll love it. But if you're a pickier fan who can't just turn off their brain and enjoy it, like I apparently was yesterday, you may have a rougher time. Mike Fatum is the Editor in Chief for the Ace of Geeks and one of the hosts of the Ace of Geeks Podcast. He always makes his Marvel. Did you enjoy this article? Follow us on Facebook to get more great content! We have a weekly podcast you can find on our main site. Also follow us on Twitter and Tumblr! Is Asa Butterfield Our New Spiderman? iZombie Ep 4 "Liv and Let Clive"
Arya Stark joins Doctor Who! DC Reveals The Cities Of "Convergence"
Who will be the All New, All Different Avengers? Cosplay Shennanigans Vs the World! Episode 143: Somebody Better Open Up a Window! First Footage of Live-Action Attack on Titan! New Avengers Trailer: Hear Quicksilver Speak! Terry Pratchett, a Golem, a Dwarf, and Me. Sir Terry Pratchett Passes Away at 66. Tron 3 Shooting this Fall? Age of Ultron, Trailer 3! First Trailer for Community Season Six! Drew Goddard to Write and Direct New Spider-man?